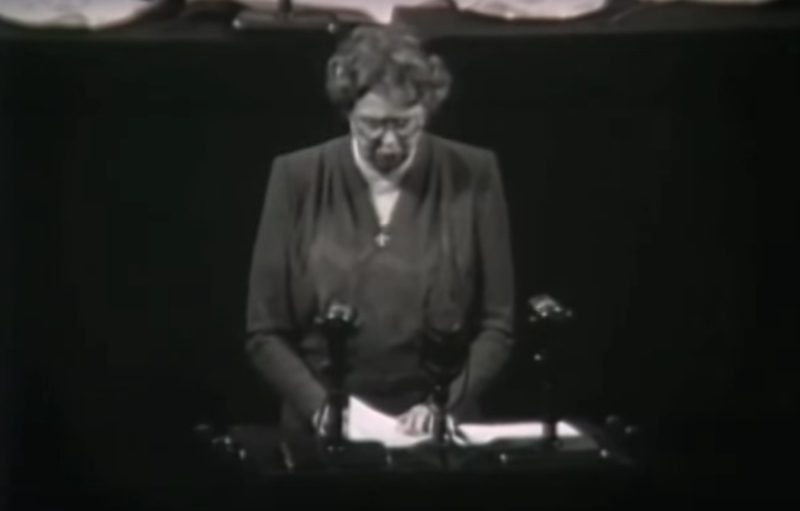 On December 10, 1948, the United Nations adopted the Universal Declaration of Human Rights. To mark that anniversary, in 1950 the United Nations General Assembly passed Resolution 423 (V) (4 December 1950), inviting all States and interested organizations to observe 10 December of each year as Human Rights Day. As has been the recent practice, for this year the United Nations adopted a specific theme: "Stand Up For Someone's Rights!" 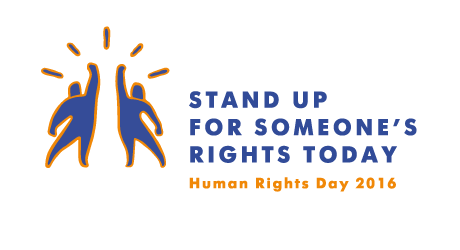 This year, Human Rights Day calls on everyone to stand up for someone's rights! Disrespect for basic human rights continues to be wide-spread in all parts of the globe. Extremist movements subject people to horrific violence. Messages of intolerance and hatred prey on our fears. Humane values are under attack. We must reaffirm our common humanity. Wherever we are, we can make a real difference. In the street, in school, at work, in public transport; in the voting booth, on social media. The time for this is now. “We the peoples” can take a stand for rights. And together, we can take a stand for more humanity. It starts with each of us. Step forward and defend the rights of a refugee or migrant, a person with disabilities, an LGBT person, a woman, a child, indigenous peoples, a minority group, or anyone else at risk of discrimination or violence. Upholding human rights is in the interest of all. 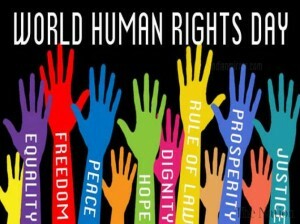 Respect for human rights advances well-being for every individual, stability for every society, and harmony for our interconnected world. And this work can be done by all, at every level of society. States have the primary responsibility for upholding human rights. The United Nations, along with partners around the globe, must continue to strengthen responses to abuses, and work better to prevent human rights crises. All of us can – and must – act in our daily lives to advance the human rights of the people around us. This is the driving force behind a new global campaign being launched by the UN Human Rights Office -- “Stand Up for Someone’s Rights Today.”"(Message here). Together, the High Commissioner urges that we are to mark the day by taking a stand for more humanity (id.). This post considers this theme in the context of the global transformations that have become to emerge from out of the convergences and resistances that now mark globalization. The theme for Human Rights Day has a compelling, and to some extent, a romantic, character. What could be more compelling than a campaign that appears to invest the individual with agency to move forward the legal and institutional project of human rights, with its origins in legal requirements directed to states, and perhaps in the constitutional traditions of the states in which these individuals inhabit or through which they claim membership in a political community? There is a certain symmetry in calling for a campaign of individual agency beyond the state, beyond law, beyond the formal structures of human organization in politics by reference to that germinal declaration of human rights that itself had no legal effect and no formal force or effect in law, in states or in the human communities that embraced them as an aspirational framework. Individuals, then, are to be transformed from the central object of the great human rights edifice built on the foundation of the Universal Declaration of Human Rights to its driving force. That is, the centrality of human rights is to shift from a passive reliance on institutional structures--of states, of enterprises, of non-governmental organizations, of religion, of international organizations--to an active and personal authority to embed in social relations, and in political action grounded in these social relations. This is the truly transformational idea within the call to to "make a real difference. In the street, in school, at work, in public transport; in the voting booth, on social media. The time for this is now." ("Stand Up For Someone's Rights!"). And yet to take this revolutionary notion at face value--which is worth considering--is to again wrestle with the contradiction of the legalization of human rights embedded within individuals administered through states, and the call to transform the individual into the incarnation of law and its enforcement. In an ideal world this is a description of a state of perfection--every individual imposes a uniform understanding of rights first on herself and then in equal measure on others their their everyday interactions. Each is then a small part of a global network of monitors and enforcers of a standard set of rights in the way that traditional societies once enforced communal taboos. In effect one must first embed human rights within oneself, and to live these human rights in every aspect of ones relations before one can enforce them in equal measure within the communities in which one exists. Human rights, then, is endogenous to the person. Where societies start form the notion of individual autonomy, this foundation of rights seems both natural and inescapable. Although the Declaration with its broad range of political, civil, social, cultural and economic rights is not a binding document, it inspired more than 60 human rights instruments which together constitute an international standard of human rights. Today the general consent of all United Nations Member States on the basic Human Rights laid down in the Declaration makes it even stronger and emphasizes the relevance of Human Rights in our daily lives. (OHCHR, Human Rights Day). 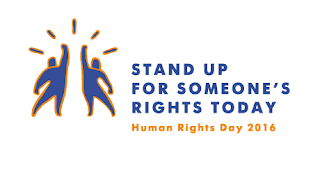 It is here, in the simultaneous embedding human rights as both founded on exogenous and endogenous principles that the extent of the contradictions of the "Stand Up for Someone's Rights! campaign becomes unavoidable. It is in this context that one might think about this "Stand Up for Someone's Rights! campaign in another light. The Campaign reminds us that human rights was commenced as a project of the international community directed at states; that states, indeed, do have the primary responsibility for upholding human rights, and that the necessity for such a campaign might well reflect a consensus that states remain incapable of undertaking such a responsibility. It suggests that rights based legal structures built on an exogenous relationship between rights and their object have failed to adequately protect the object of such rights reducing the great human rights legal edifice to a interconnected global self help program endogenous to its own objects. The fundamental underlying premises of the Stand Up for Someone's Rights campaign, then, is centered on the inextricable union between the individual person and the complex of rights that defines her in herself and within the community of individuals. That is, human rights are not derived from states or international organizations; they are derived from the essential nature of the human person. It follows that neither states nor other communities of persons are capable of doing more than recognizing those rights. And as a consequence it is for autonomous persons, as individuals or in communities (religious, political, societal, etc.) to deploy the apparatus of communal governance (the state, religious institutional ministers, societal leaders, enterprise officers and the like) to protect those rights. Here one reads Stand Up for Someone's Rights! with the emphasis on the unitary concept of the individual defined by her rights. And yet the "Stand Up for Someone's Rights! campaign suggests another important point, one that draws the focus away from the individual and beyond the relationship between the individual and rights, to focus instead on the obligation to stand up for the rights of others. This would shift the emphasis from "Someone's Rights" to "Stand Up." Thus reframed, it is possible to understand human rights not as built on an endogenous set of rights incarnated in the individual, but rather as a set of exogenous obligations to protect the integrity of the individual by ensuring respect for their rights. Thus, the Human Rights project may not be focused so much on building the normative structures of those rights that constitute the individual in society (political, economic, religious, etc. ), precisely because those rights are already built and inherent in the individual irrespective of the community within which individuals are situated. Rather, human rights as a societal project (political, economic, religious, etc.) is centered on the obligation of individuals (including foremost communal individuals: states, enterprises, civil society organizations, religious institutions, etc.) to "stand up" for the rights of others. In other words, human rights might be better understood as a set of endogenous obligations creating exogenous duties to others. It is those exogenous duties that serve as the substance of human rights. Within this frame of reference, human rights is better understood as a system of duties for others rather than as a system of rights centered in the self. But, if rights are endogenous to the person, where are duties situated? At one level, the campaign speaks to the obligations of the individual in that respect to "others." These are interpersonal obligations that are only indirectly connected to law, to politics or to the structures of society in any respect. This constitutes the return to the ideal of the individual duty connected to a set of rules disconnected form the sources of political, economic, religious or societal power, yet marbled within each. But those obligations, within the current framework of human rights, ought to be understood as secondary (and as suggested above as a sign of the breakdown of the system itself). The individual was never understood to have free agency with respect to the human rights of others--she hardly has agency with respect to the "rights" with respect to which the individual is vested. From the first, and in its modern form, the natural rights notion of human rights at the heart of the individual agency approach to human rights, was rejected by the incorporation of the project within and as a means of strengthening and authenticating, the state system revived in its current form through the United Nations. Westphalia, and the autonomous international community as a framing structure, then, provide the basis within which it is possible to conceptualize human rights as both obligation and substantive norm. And it follows that human rights would be constituted as "law" and incorporated into the state system as the primary obligation of its apparatus. Yet, if that is indeed the case, then it might also follow that for the state--irrespective of the conceptual relationship of rights to the individual--for the state human rights must be expressed through the fulfillment of its obligation to use its government to "stand up" for "someone's rights!". In effect, then, what the campaign reminds us is that the principal human right is the obligation of states to stand up for them. Within globalization, though, this basic idea has been expanded from the state to all enterprises and communities who assert regulatory power over others. In effect, then, the essence of human rights is an essential corollary and basis of legitimacy for the exercise of regulatory and administrative power--by whoever or whatever exercises those powers. Within a particular territory that entity may be a traditional nation state, or it may be a local community, or it may be an enterprise r a series of enterprises interlocked through relationships in production chains. Equally likely, it may be religious or non-governmental communities that assert the power of government over a community of adherents (e.g., here). In each case the focus of human rights ought to be on the obligation to "stand up!" --the obligation to recognize the normative structures human rights, the relationship between those rights and its objects, and the connection between governance legitimacy and the obligation to vindicate those normative rights for "someone" within the governance community. There are consequences to an understanding of human rights as intimately connected to the responsibility to protect the human rights of others, especially those over which dominion is asserted in some form. First, it suggests that efforts to centralize human rights within a legalized framework attached to states distorts the and narrows the context within which human rights obligations arise and must be exercised. This has implications for any comprehensive treaty for human rights and business. Second, it suggests that human rights must be a central element of the obligation structures of all states irrespective of their ruling ideology. Human rights as a set of legitimating obligations of governments to their subjects are as central to Marxist Leninist states as they may be to markets based democracies. Third, it does suggest that the totality of human rights may not be captured by projects of legalization. Indeed, it makes clear that human rights as the normative conception of the basic structures of power-obligation within social systems exists beyond both state and law, at least in some respects. Fourth, it serves as a reminder that rights are ephemeral in the absence of remedy, but that remedy is not inextricably merged into the right itself. Fifth, that means that though individuals may be rights holders, the remedial authority may be bound to the obligation to protect human rights inherent in the state or other governance community, whose legitimacy may be bound up with its fidelity to that obligation. And sixth, in the absence of the fulfillment by states and other governance organs of their fundamental human rights obligations to "stand up for others", the fundamental human rights of individuals is to stand up for themselves and to band together to stand up for each other. Where states, enterprises and others fal in their own duties, the individual is called to action, to become the agent for the protection of her own human rights.